People gathered along Lubec Narrows on Friday, January 5, 2018, to see the remains of the herring brining shed of McCurdy's Smokehouse. The building went about 100 yards out to sea before becoming hung up on pylons. Thursday’s blizzard washed a piece of national history into Lubec Narrows on Friday, but it might be recovered. 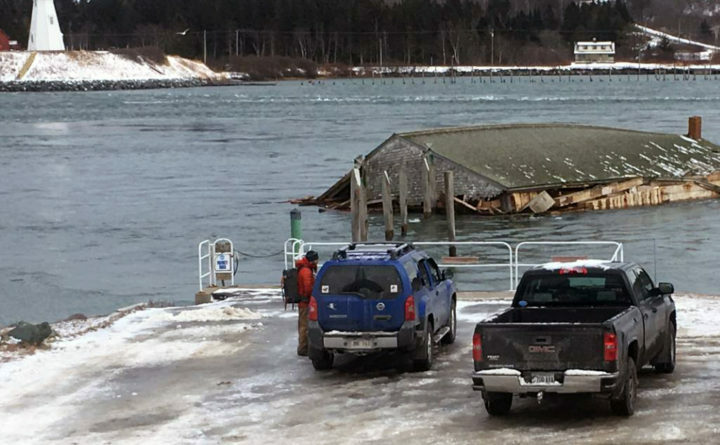 Storm-driven winds and waters carried the herring brining shed’s remains about 100 yards from its pilings at McCurdy’s Smokehouse in Lubec before the channel’s waters receded on Friday. Contractors plan to meet Saturday to determine whether the structure’s remains should be salvaged or scrapped. The shed is among five buildings on the National Register of Historic Places at McCurdy’s, which was the last traditional smoked-herring facility in the United States when it closed in 1991. It was the site of almost a century of raw, pickled and smoked herring production, said Rachel Rubeor, president of Lubec Landmarks, a 130-member nonprofit organization that has worked for almost 25 years to preserve the site. Sitting precariously atop westward-slanted wooden pilings in the inlet between Lubec and Canada’s Campobello Island, the fragile shed had already been heavily damaged by a snowstorm last winter, said Craig McCaslin, a 62-year-old Lubec resident who spent most of Friday at the site. The building’s remains — its roof and some of its foundation — spun 180 degrees as they floated in the channel, and bizarrely, the chimney appears intact, a tribute to its builder, McCaslin said. “I’d like to hire that mason,” McCaslin said. McCaslin voiced concern that the building’s remains could damage the bridge between Campobello and Lubec if debris hit an unprotected piling. Town officials notified the U.S. Coast Guard and Maine Department of Transportation about the hazard, Lubec Town Administrator Renee Gray said. The shed’s collapse changes the landscape of Lubec, said Carol Dennison, chairwoman of the Lubec Board of Selectmen. “It’s really sad that the history of the town and the last sardine house has met its grave,” Dennison said. Operating from about 1906 to 1991, the plant was a complex and unique piece of Lubec, employing about 30 people. A bell or whistle would sound, calling them to work whenever the fishing fleet arrived, Rubeor said. Sluices carried the fish into the brining shed, where they would sit in saltwater for about 48 hours. The herring could be lanced with sticks and smoked in the smokehouse for three or four days or skinned in the skinning shed before going into a meat market building for packing and shipment. A fifth building, the sawdust shed, fed the smokehouse, Rubeor said. The herring could go anywhere. One favorite destination: bars in Chicago, where the heavily salted fish went down well with beer, Rubeor said. Environmental regulations and changing tastes put McCurdy’s on the endangered list long before it went out of business, Rubeor said. She expected bad weather would eventually destroy the brining shed if her organization couldn’t save it. Whether salvaged or not, the shed’s future is problematic. Lubec Landmarks, which accepts donations through its website, needs money to get the shed out of the channel. It had secured a $15,000 grant from Maine Community Foundation to repair the brining shed if it could be moved to a better location within the complex, Rubeor said. Lubec Landmarks also applied for a federal grant of up to $500,000 for the shed project.